Marc Chagall demonstrates the best arm positions for spooning in Over the Town. Chagall’s muse was his first wife, Bella Rosenfeld, who was the sophisticated daughter of a wealthy jeweler. The little brat tested her parents’ patience when she decided to marry the hopeful artist. Thankfully, Chagall went from being a meager apprentice to being a hot-shot modern artist who seemed to live off of women’s audible gasps at the sight of his scandalous images. In many of Chagall’s paintings, Bella can be seen floating through the air. 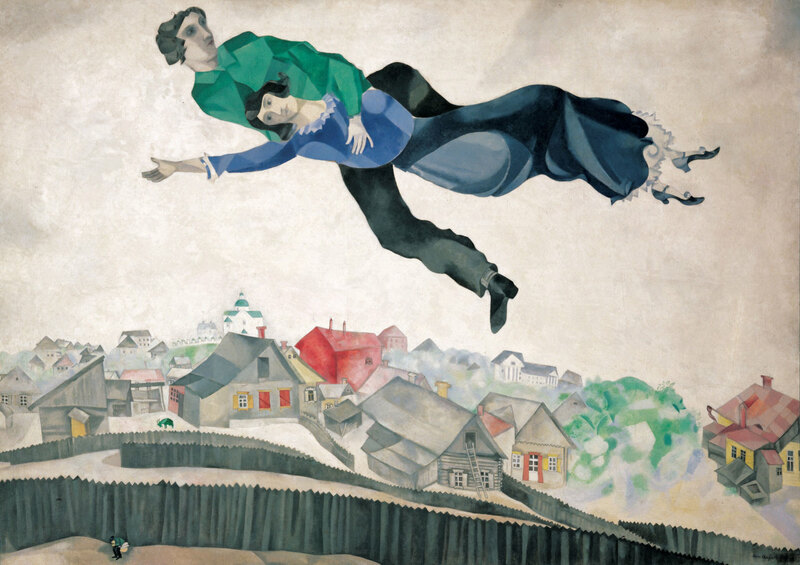 Over the Town shows the couple flying over their hometown of Vitebsk in love and elation. Perhaps the artist had a different kind of “love” in mind as he was prone to depict figures with their bodies entangled in a jumbled mess. In Over the Town, the couple can be seen awkwardly spooning. They seem to be caught up in the all-too-common dilemma of finding the most comfortable place to put their arms while in this situation. The answer: nowhere, it’s impossible. The questionable positions of his subjects got Chagall into some trouble in Paris, when he first started showing his pieces. Despite his subjects being fully clothed, the artists’ mishmash of legs and arms pointing in every imaginable direction was enough for viewers to deem his pieces as pornographic. Understandably, Bella is exposing a little bit too much wrist in this one. Aside from being the muse of a famous artist, Bella was very well-educated and tried her hand at being a writer. Unfortunately for her, her husband’s success in the creative form far surpassed any success she, herself, experienced in her lifetime. It wasn’t until after her untimely death from a viral infection that Chagall would publish what would be his wife’s most famous book titled Burning Lights: A Unique Double Portrait of Russia. The book received 4.5 stars on Amazon with 7 reviews. This is a superb rating, but the lack of reviewers makes me question its validity and wonder if maybe Chagall paid off some fans to write his pretty wife a nice review. A big source of attraction, which sellers are always sure to mention, is that the book includes 36 pen-and-ink line drawings from her husband, who somehow finds a way to make this about him. Rude.